Since the rigged tenkara rod has no reel, you need something to manage the line. Tenkara line holders and line keepers make both long-term storage and moving from spot to spot organized and convenient. 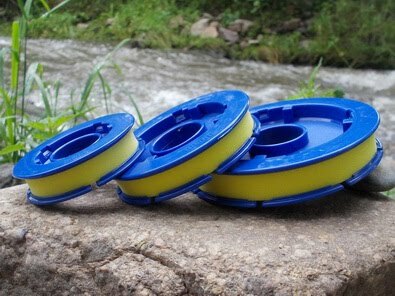 MEIHO "Shibimaru"spools are really useful tenkara accessories. Normally the furled Tenkara lines come without a spool and the line holders are great for winding rigged line with a fly and leader. The notches are good for holding flies. While the foam core secures the ends of the line, as well as assisting it to dry off quickly. Now available in two diameters - 70mm and 90mm . The most recently used are the 70 mm holders. The holders are sold in 2 pcs packages from manufacturer. The indicated prices are per pair. ONI TM spools by Raj Leica are one of the best for tenkara fishing lines. Foam inner part do not scratch rod varnish, it has special place to attach the fly. Bright yellow colour makes it high visible. 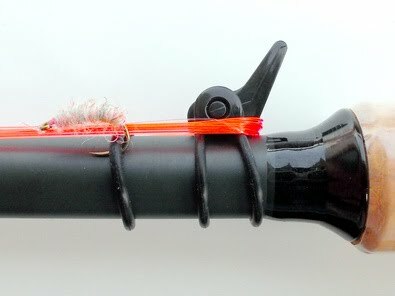 The notches are good for holding line ends, this spool is the best for CZ nymphing rigs. Spool diameter is 70 mm. It is reviewed by Jason Klass and by Tom Davis. NISSIN PALS FUJIRYU tenkara line holders -"Shikake Maki" - are designed by Mr. Hiromichi Fuji. It is really good spools that are very comfortable because of the inner part made with foam and the special section for the attached fly. Also it is beautiful. It is reviewed by Tom Davis. 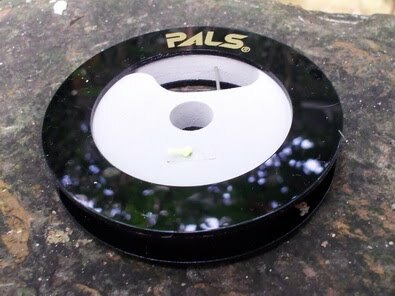 The spool diameter is 65 mm. There are two spools in the package. The Fuji EZ Keepers offer a convenient way to manage your line when you collapse your tenkara rod. Perhaps their biggest advantages are that you will not get line twist and your fully rigged and collapsed rod fits inside the rod sock so you can be ready to fish in seconds. 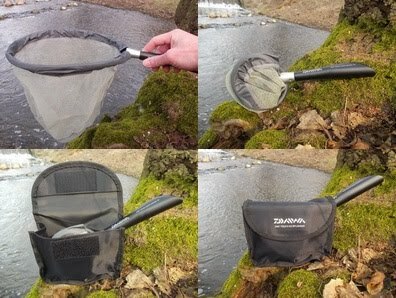 For tenkara line holders, two EZ Keepers are required: the indicated price is per pair. Daiwa TM OneTouch Keiryu Damo collapses and fits in the pouch on your belt. The rim of the net is like a spring and opens to its full size and rounded shape. To put it back to the pouch, you simply twist it past a certain point and it then twists in on itself and will retain its collapsed shape. The extended net diameter is 25 cm. 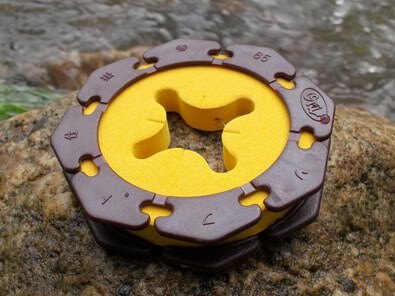 This gadget can be used not only for tenkara fishing.